If you ask me (I know, you didn't, but here it is), a Valentine's Day in can be pretty romantic. Mostly because you're not stuffed into an overcrowded restaurant with specialty (or, hiked) prices for the occasion. It's more intimate, more about the shared experience. Though Colin and I do a lot of cooking at home and a lot of cooking together, we decided to stay in and prepare a special meal anyone, one that came from the present I got for him, The New Persian Kitchen. Full of tons of tips and tricks for recreating traditional Persian dishes at home (and, okay, a few meat-based recipes, but we'll just skip right past those), this book by Louisa Shafia introduces a modified take on Persian cooking that celebrates seasonal eating and lighter fare. Just take me to the dessert section, okay? 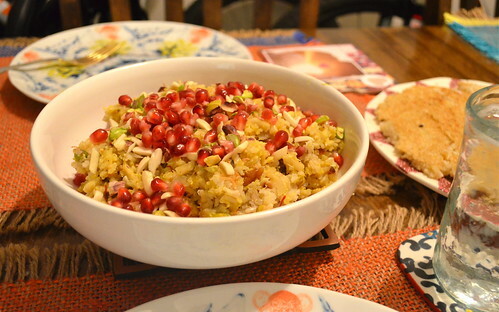 No but seriously: we paged through the options for our Valentine's Day special and somehow settled on a jeweled brown basmati rice and quinoa dish. Just a quick side note here: I totally thought I invented the quinoa-rice combo, even aptly naming it rice-oa. There is a documented evidence of this somewhere. But apparently the Persians have beat me to it. This aromatic rice dish is full of heady sweetness, spices and lots of roasty-toasty nut flavors. Brace yourself for it, because this dish requires a little bit of advance planning and preparation. Possibly even some online ingredient ordering - rose petals, anyone? Ah, but all in the name of love; so worth it. Also hard to come by in a traditional grocery store are dried rose petals; if there are no specialty Mediterranean or Middle Eastern markets nearby (and why not, I have to ask? ), you could always take to the Internet, where you can find just about anything. Unfortunately, I didn't consider this option soon enough, so we weren't able to include the rose petals in this take. Note: It's super important to specify that you need edible rose petals, not just any old rose petals. Most flower shops sell plants that have been sprayed and treated, which would definitely taste the opposite of good. Whew. Okay, first thing to mention: depending on the rice and quinoa you've got, you may not need to soak the grains for quite so long. Though I've only taken one stab at this recipe so far, I do admit that the rice mixture came out a little sticker than I would have liked, which I believe had something to do with the quinoa getting a tad overcooked (with the soaking, plus the boiling water, you get it). 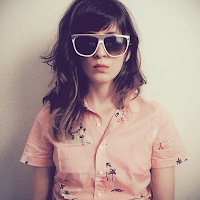 To each their own, however, and I would recommend trying it the directed way first and adjusting from there. After your grains have soaked, drain and rinse using cold water. In a medium pot, bring about 4 cups of water to a boil. In the meantime, heat another medium stockpot over low heat and at your soaked (but drained) rice and quinoa with about 2 tablespoons of your grapeseed oil and a bit of salt. Using the pot to toast your grains; stir often to prevent burning or sticking. 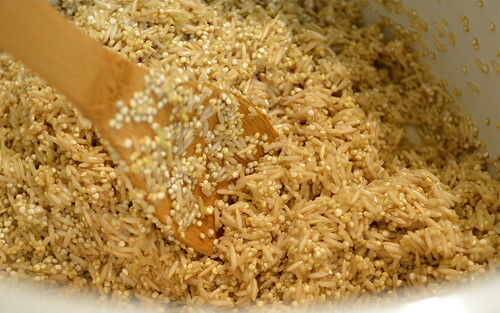 In about 5 minutes, the rice will get super nutty and fragrant. At this point, add your boiling water; allow to return to a full, roiling boil, then reduce the heat and cover, cooking for about 40 minutes. Meanwhile, chop up your dried fruits, soak your saffron (watch those fingers if you don't want them to turn a pretty shade of yellow) and toast your nuts. Then chop your onion and sauté in a large skillet over medium heat using the rest of your grapeseed oil. Cook for about 15 minutes or until slightly caramelized. At this time, add your dried fruits, spices and rose petals, if you've got them. Cook together for 5 minutes more or until thoroughly heated. 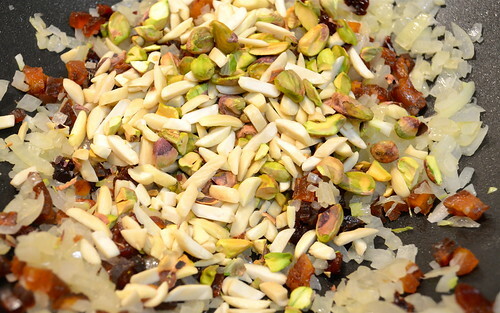 Reserving half of your pistachios and almonds, toss the other half in your onions, spices and fruits until coated. Season with a bit more salt and remove from heat. After all that, your rice should be just about through cooking. At this stage in the game, you could attempt to make tahdig (tah-DEEG) with some of your rice, which literally translates to "the bottom of the pot." Tahdig is "the panfried layer of crust at the bottom of the rice pot." Crunchy, golden, beautiful stuff. 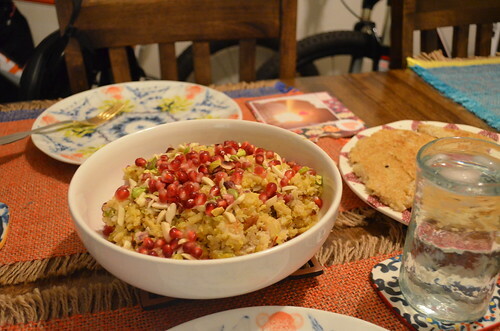 We went with what Shafia called "faux tahdig." I can deal with a little faux for my first attempt, since the idea of creating tahdig traditional-style was just a tad daunting: next time! For a little faux in your life, reserve about 2 cups of your fully cooked rice-ua. Preheat a deep skillet or paella pan (or if you own neither, a wok). It's super important to let the pan get thoroughly hot, so says Shafia, in order to ensure the crispy outer layer for which tahdig is known. Add about 3 tablespoons of your oil of choice (I went with coconut) then add your rice. Spread the rice evenly on the bottom of the pan, tamping it down tightly with the back of a spoon. Sprinkle with salt. Spread a clean dish towel over the top of the pan (to catch excess moisture) and cover the pan tightly. Cook for about 10 minutes on the medium-high heat setting. Turn the heat down to low and cook for another 10 minutes. Try to resist taking a peek, since you could risk running the trapped moisture back into the rice. After 20 minutes, loosen the tahdig with a spatula or butter knife. Most likely with the assistance of another person (or your Valentine! ), flip your tahdig onto a plate. Cross your fingers that it comes out whole! But no sweat if it does not: perfect tahdig takes practice! Alright, back to the rest of the story. For the rest of your rice, add your coconut oil or butter and fluff with a fork. Mix in your sautéd onions, dried fruits and nuts. 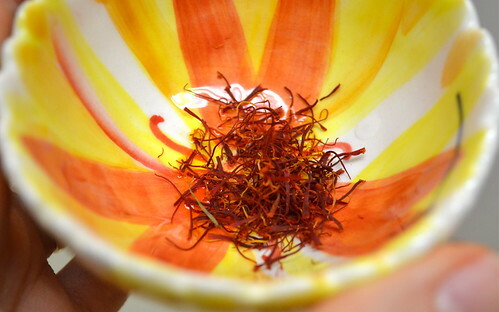 Sprinkle with additional sea salt, if you're so inclined and drizzle saffron over the top. Mix together until combined enough. Transfer to your serving dish of choice and sprinkle with reserved nuts and pomegranate arils for a crazy pop of color. 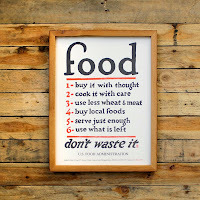 AND antioxidants. Zing. I don't know what to tell you guys. This is definitely a dish for the books. I hesitated over the fruit and cinnamon factor, wondering if it would be too sweet. Not a chance. 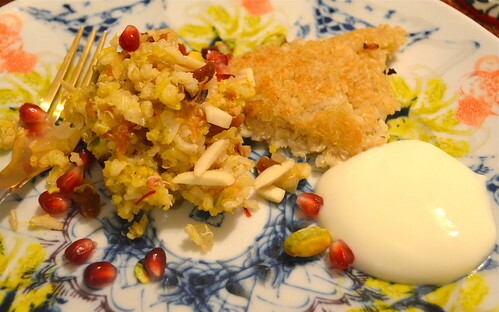 Perfectly mixed with the basmati rice and nuts, this dish was anything but dessert. (Mostly because dessert was vegan peanut butter cups and vegan coconut truffles, but you know what I mean.) We paired this deliciousness with a fennel blood orange salad: way good. I myself also included a bit of yogurt on the side. How very Persian of me! My (basically vegan) sweetie, however, did no such thing. Here's to love at the table, or wherever you may find it.